are either to use metal shuttering or brick skins to hold the concrete core. retaining walls quickly and cost effectively. VARIBLOCK is an expanded polystyrene formwork system for concrete retaining walls. VARIBLOCK is an expanded polystyrene formwork system for the construction of concrete retaining walls and comes in 3 block widths for differing wall heights and retaining requirements. formwork allowing concrete to be poured between the panels creating a reinforced concrete wall. 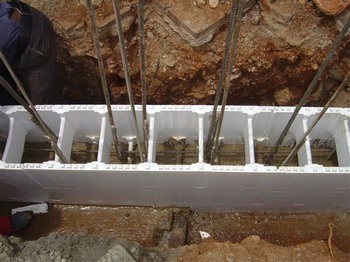 The side panels are held together by a series of internal expanded polystyrene cross braces which are slotted into position between the vertical rebar to hold the side walls in position and maintain a flat and perpendicular wall. The polystyrene formwork stays in position and acts as both a thermal and moisture barrier which is of value for applications such as basement retaining walls. The size of the VARIBLOCK side panel is 1200mm (l) x 300mm (h) and is 30mm thick. The VARIBLOCK system has 3 different spacer sizes - 330mm, 240mm and 180mm. 1) Wall foundations are constructed as normal but maintaining the foundations as level as possible and where stepping is required steps are kept at a height of 300mm, which is the height of the VARIBLOCK panels. Vertical rebar is placed as normal. 2) The first row of VARIBLOCK side panels are placed onto small piles of concrete along the foundation length and levelled. It may be necessary to move the VARIBLOCK or vertical reinforcement laterally to ensure the rebar does not interfere with the VARIBLOCK spacers. The VARIBLOCKs or vertical reinforcing is moved to ensure the rebar does not interfere with the spacers. 3) To consolidate the position of the wall the base VARIBLOCK should be filled three quarters with concrete. 4) Continue building up the wall with the VARIBLOCK side panels and spacers to the height of 3 blocks (900mm). Each successive side panel must be staggered over the joins of the panels below to secure and brace the panel joins. 5) At wall ends slide the VARIBLOCK end closure pieces into position. When cutting VARIBLOCKs at wall ends always ensure that the block is cut in such a way that the slots for the end closure are at the wall ends. 6) Fill the 3 block height of the VARIBLOCK with concrete and do this each successive 3 block levels. 7) After the base wall level has been built and concreted it is normal practice to position the remaining vertical rebar by tying this to the starter bars. 8) Keep the tops of the VARIBLOCKS free of concrete and cement by brushing with a block or paint brush. This is essential if each level of VARIBLOCK is to fit securely to the ones below. 9) If the retaining wall needs to be staggered in its height VARIBLOCK comes in 3 different widths – the front panels remain perpendicular with a flat face and the wall is staggered on the back side. 10) Once the wall is built to its full height the castellations on the top of the VARIBLOCKS must be removed and the top of the wall water proofed with a clear sealer – POLYSEAL or a suitable water based, water proofing liquid. 11) Water proofing of the retaining wall is done by conventional methods. If using torch on systems the wall must first be plastered with a specialty expanded polystyrene plaster - POLYPLAST. 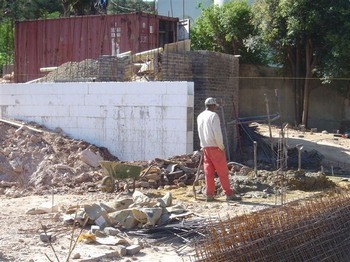 12) The front face of the retaining wall must be plastered with POLYPLAST. The VARIBLOCK components, side walls and spacers, are made out of lightweight expanded polystyrene and are easy to carry and position. The side walls fit tightly together and can be quickly and smoothly put together. The side wall spacers slide easily into place. As the system components can be readily moved around site and are quick to install compared to brick and metal formwork less labour is needed to build a VARIBLOCK wall. VARIBLOCK comes in 3 different widths allowing retaining walls to be stepped if necessary and walls of different heights to be safely constructed. For basement retaining walls VARIBLOCK has the added benefit of providing thermal insulation to the basement area. VARIBLOCK is a shuttering system for reinforced concrete walls and the walls are designed using conventional reinforced concrete design methods. The VARIBLOCK shuttering remains in place providing permanent thermal insulation and moisture barrier to the wall. EPS is rot, rodent and termite proof and will not deteriorate over time. VARIBLOCK is less expensive than using either brick skins or metal shuttering for retaining walls. Plus it is quicker to install needing less labour. There is no requirement for external horizontal bracing when building with VARIBLOCK as the bracing is within the wall itself. VARIBLOCK is supplied in 3 different width options; 330, 240 and 180mm. Each block comprises 2 side wall panels and 5 cross bracing pieces with the option of a slide in end closure for wall ends. If required ABP can provide full engineering design service for retaining walls.